So out of tragedy, they forged their love story. They applied for Air Bears 2. He braced himself for the next step, and called her to meet him on the Glade. “In class … text instead?” she typed. He took a deep breath, willing himself to say it. She watched the gray “…” with a growing anxiety. She sent a screenshot of the message to her roommate. They’d been wondering when he’d ask. He watched her icon travel down College Avenue home every night for the next two months. A few weeks weeks later, she stared at her screen in disbelief. She had fallen to third on his Snapchat “best friends” list. She flipped through her phone. With no one to text, how was she going to look effortlessly and completely unavailable while strutting through campus? Her friend was once so enraptured in a text conversation with her boyfriend that she walked straight into Sather Gate’s marble pillars. She wanted that sort of love. She began to cleanse him from her life. Maybe she’d subtweet? No, things weren’t that dire. But she felt he owed her something after the breakup. She typed a fragment of a poem in her phone’s “Notes” section and waited for 10 minutes in anticipation before realizing no one could like it. She began to feel helpless. 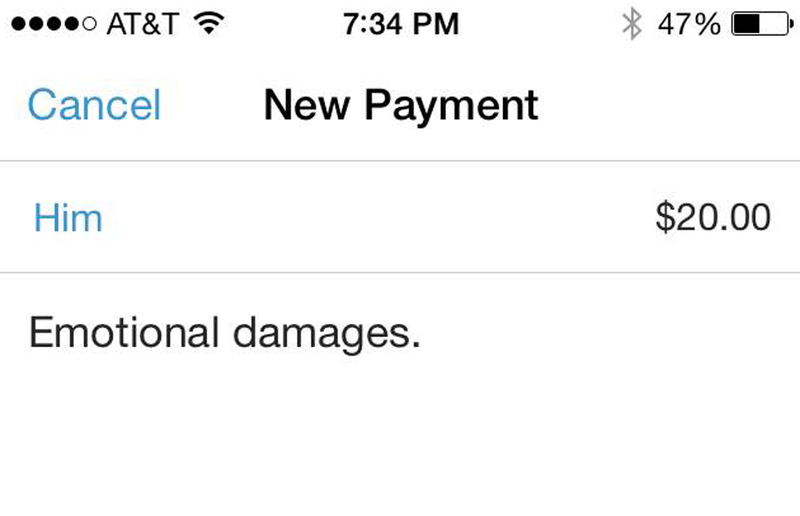 As she scanned her apps, her eyes fell on Venmo. She’d downloaded it recently to pay him back for their shared Spotify account. She opened the app and wrote a new message to him. $20.00 for “music,” she typed out. She’d buy her own account. But that felt wrong. This was their first communication, and if it wasn’t going to be a passive aggressive Facebook like or a group snapchat, she would have to make it good. “Emotional damages,” she wrote. That felt right. Honest. He owed her. She clicked “Request” and watched a thin blue line cross her iPhone. Request sent. “This must be how it feels to work at Bank of America,” she thought, wondering why all her friends spent their summers investment banking when they could’ve just used this app. But $20.00 didn’t cut it. She stopped the frenzy, invigorated. Five minutes later, her phone buzzed. He had paid her in full. And sent a charge: $55.00 — “For 11 months of my life.” She sent him the cash. Her phone lit the dark walk through Sproul Plaza as she headed home. She had downloaded Tinder. It was September again.